Chris McIntosh (born February 20, 1977) is a former American college and professional football player who was an offensive tackle in the National Football League (NFL) for two seasons during the early 2000s. McIntosh played college football for the University of Wisconsin–Madison, and earned consensus All-American honors. 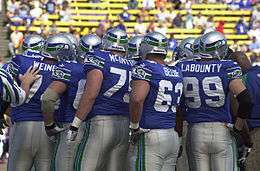 He was drafted by the Seattle Seahawks in the first round of the 2000 NFL Draft, and played professionally for the Seahawks until his career was cut short by an injury. McIntosh was born in Pewaukee, Wisconsin. He attended Pewaukee High School, and played for the Pewaukee Pirates high school football team. McIntosh attended the University of Wisconsin, where he was a standout tackle for the Wisconsin Badgers football team from 1996 to 1999. As a senior in 1999, he was a team captain and a first-team All-Big Ten selection, and was recognized as a consensus first-team All-American. McIntosh was a member of the Badgers' Rose Bowl championship teams in 1999 and 2000. He was inducted in the UW Athletic Hall of Fame in 2014. Along with Shaun Alexander, McIntosh was drafted by the Seahawks in the first round in 2000; McIntosh's playing time increased as the 2000 season went on. McIntosh started in 10 games for the Seahawks as a rookie, but was limited to three starts in 2001 because of a recurring neck injury he suffered during training camp. McIntosh retired from the NFL after the 2002 season. ↑ 2011 NCAA Football Records Book, Award Winners, National Collegiate Athletic Association, Indianapolis, Indiana, p. 11 (2011). Retrieved June 25, 2012. ↑ "Hall of Fame". University of Wisconsin-Madison Athletic Department. Retrieved November 25, 2014.